This is a review of different RVs that I looked at or that stood out for me after I recently opened my mind to travel trailers that aren’t Airstreams. I also became open to getting a new or newer RV (vs. one that's 40+ years old). I love vintage Airstreams, and have owned three of them. I am interested in smaller trailers, 20 feet or less, with an emphasis on less. Lightweight is important, but I also lean to a trailer I can stand up in with full amenities: AC, full bathroom, kitchen, etc. Some of the brands I discuss offer bigger floor plans too. Also included are some you can't stand up in but stood out as appealing options. 1. CampLite by Livin Lite--This one captured me. I bought a 2018 CampLite 11FK. Visit my main blog and scroll down for recent posts on this trailer. The main attraction: the all aluminum frame, including the chassis, and no wood floor or wood anywhere. Steel rusts and wood rots. The CampLite trailer offers a nice blend of utilitarian and solid, but with nice finishes too. The finishes and the overall look are things that KZ/Thor got right, even as they began to drift away from Livin Lite founder Scott Tuttle’s original vision. Livin Lite is a subsidiary of industry giant Thor (the number one RV manufacturer based on market share) and they are managed by KZ, another Thor subsidiary. Tuttle sold to Thor in 2013 and left in 2015. While I was interested in the smallest 2018 CampLite, I liked the other floor plans too and for people in the market for a larger trailer (not 5th wheel large--though CampLite did make 5th wheels for a couple of years), this is a great product: built to last with nice designs/finishes. Legacy RV in SLC is the Utah dealer. 2. Lance Campers--This is a brand I was completely oblivious to prior to this latest investigatory phase. Their 1575 model would be the one for me. It’s at the big end of what I was considering. Lance also has many larger travel trailers for people looking for something bigger, but still in the category of what the industry classifies as lightweight. They are further along the spectrum toward luxury--not so far down it as modern Airstreams, but further than CampLites. The biggest drawback I see to the Lances is that their tastes in decorating leave something to be desired both inside and out. What is it with so many RVs that have graphics that a fifth grade boy would likely find cool? This is a matter of opinion and the quality of these trailers far outweighs my lack of enthusiasm for their decor--which could be changed. With Lance you'll get a very high quality trailer. While it would be half the price of a similar sized/year Airstream it was much more than I was going to spend this go around. I checked these out at Terry's RV in SLC and was impressed. I found the next three to be very appealing, but smaller than what I wanted--other than the 400 . . . .
3. T@B--It was the desire to see a T@B that led me down the slippery slope toward buying a new trailer. I find this brand very appealing. They offer a modern take on a retro design. I’ve been so focused on vintage for so long and right now I am leaning toward contemporary, cleaner looks, and amenities. T@B fit that bill well. Their new model 400 is sharp. The 400 is a bigger trailer than they’ve offered previously. The asking price of $32,000 for the new 400 is well above what I was willing to pay. Here at Parris RV in Salt Lake they had one 400 and they claimed that they would only get that one for the whole year. Whether that’s true or not, it didn’t make negotiating seem likely. If you're interested in something you can pull without a truck, check out the smaller T@Bs and even smaller T@Gs built by the same company. 4. Moby1 Expedition Trailers--These are a different class of RV, lacking many of the amenities. They look damn cool, and they’re made right here in Utah. They are beautifully designed teardrop trailers created to go into the backcountry. Of course you can also use them in tamer settings too--like RV campsites. I have to see one in person! One thing that's appealing about the Moby1s is they are made by a small company with a passion for craftsmanship. 5. Luna by inTech--Livin Lite founder Scott Tuttle works at inTech now. Luna is a new product. It’s small--as in too small for standing--but it looks very cool. It’s one of the rare RVs built on an aluminum chassis. I can’t wait to see one in person. 6. Rockwood Geo-Pro--The T@B drew me to an RV dealer but it was the Geo-Pro that really shoved me down the slippery slope toward making a purchase. The Geo-Pro 14FK has an identical floor plan as my CampLite. I dissed this trailer somewhat in my previous post but I just went back and read about it again, and think it’s probably decent. It’s cheaper by $3k to $9k compared to mine (depending on your negotiating skills), so a few of the finishes/features I liked I paid for. One big difference is my CampLite has an aluminum chassis. After some of my research I am still gun shy of Forest River (Rockwood’s parent company) since they paid a $35 million settlement with the National Highway Traffic Safety Administration less than three years ago for shoddy work and not honoring their warranties. The Geo-Pro also lacked any under-belly, which I found shocking after being a long-time Airstreamer. That was a detail that made it reek of being cheap, though the rest of it seemed good for what you were paying. I did love the size of the 14FK and even some of the bigger floor plans. The next group are similar in quality, size, etc., and are also in what I am calling the Middling Group. My focus was on the smaller floor plans that are available. These are what the industry would consider small and lightweight, but all were bigger, more like a regular RV than what I wanted, and good but not outstanding quality. They're also less expensive than my standouts. 7. Gulfstream’s Vintage Cruiser and Vista Cruiser--These trailers have aluminum framing though they are built on a steel chassis (like almost all trailers other than Livin Lites, VRV, Luna--and maybe a few others). The sales guy said they have wood framing in the roof, so I am not sure about the structure. The vintage look is fun (I guess I am not completely ready to give it up). The Vista Cruiser is the same trailer as the Vintage Cruiser, minus the vintage look. I don’t like the interior design of the Vistas at all. 8. Riverside Retro--If I am in a retro mood, I LOVE the looks of these--though I consider them average in quality. 9. Sonic Lite by Venture RV--This trailer is everything I hate about RVs. Stick and tin construction built on a wood floor. Off-gassing from God knows what. 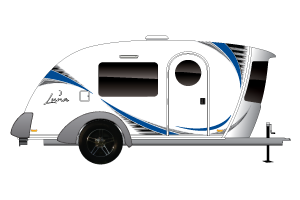 Venture RV is a sister company to Livin Lite, which is the main reason I wanted to check this product out. On the other hand, if your budget is small, this trailer will probably last 10-15 years if you keep it covered when not using it. Venture RV, Livin Lite, and Airstream are all Thor subsidiaries. There are a LOT of trailers like this one. Wood frame construction. Cheap. But still useable even if its landfill bound before it should be. 10. Airstream Nest--When I decided to sell my latest Airstream, a 1962 Safari, my thought was I'd wait a few years then find a used Nest. The Nest is a new product by Airstream due out this spring. It's a smaller fiberglass trailer and looks like it will be cool. It also probably won't be cheap, though hopefully cheaper than other Airstreams! Even before I recently saw a video where Scott Tuttle, the founder of Livin Lite, called his trailers “generational campers,” meaning they are designed to last for generations, I already got that. The design that was the foundation of that aspiration spoke clearly to me. Of course I consider traditional aluminum-bodied Airstreams in the high-end quality category despite knowing their design flaws, namely steel frames and wood floors. Anyone in the vintage Airstream community can tell you how bad those are in the long haul, almost guaranteeing rotten floors and rusted frames. But "long haul" is longer than most people think of when buying an RV. I am referencing 15-20 years plus. Even I am unlikely to own any one trailer that long. Since any RV can leak . . . the materials they are made of really matter. My attraction to CampLite is clearly heavily informed by being so immersed in vintage Airstreams for so long. Other than the Nest, I left Airstream's smaller trailers off the list. They are great trailers, just substantially more expensive. They make the T@Bs and Lances seem downright affordable. Also, my purpose here is to look beyond Airstream since that's all I've ever had. I stand with quality workmanship as much as I possibly can, and as much as I can possibly afford. When it comes time to resell your RV, you’ll benefit by that philosophy too. Not to mention minor details like the benefits to the environment of products that last long and are recyclable/reusable. I haven’t written about that last point but my all-aluminum CampLite is 90% plus recyclable. Happy RV shopping and/or dreaming . . . . from someone who knows just enough to be dangerous. I am looking forward to going to the RV show here in SLC a week from now, though I’ll also be somewhat rushed as I will be getting on the road for a long weekend in my new CampLite. The prices of these new trailers ranged from as low as $15k ish for the Sonic by Venture RV or the smaller ones including Moby1 and T@Gs. At the higher end, prices were in the low to even mid $30s. Prices are extremely variable even for the same model. Dealers tend to list prices that have a ton of room for negotiating. The best "reality check" in my opinion is to look up particular models on RV trader. Both dealers (for new) and individuals list RVs there. That way you can see the range of what's being asked for the same trailer. When I went to buy I told them I needed to pay at the low end of the range based on my RV Trader research and they quickly agreed. If you are buying new you can save 20 to 40% off of MSRP by doing your homework and being willing to walk away. Often dealers will already have discounted from MSRP in their price, so don't always expect to save 20-40% from the posted price. Some trailers are in higher demand and dealers will be less willing to come down on those, but they'll pretty much always come down some. Definitely consider used too.